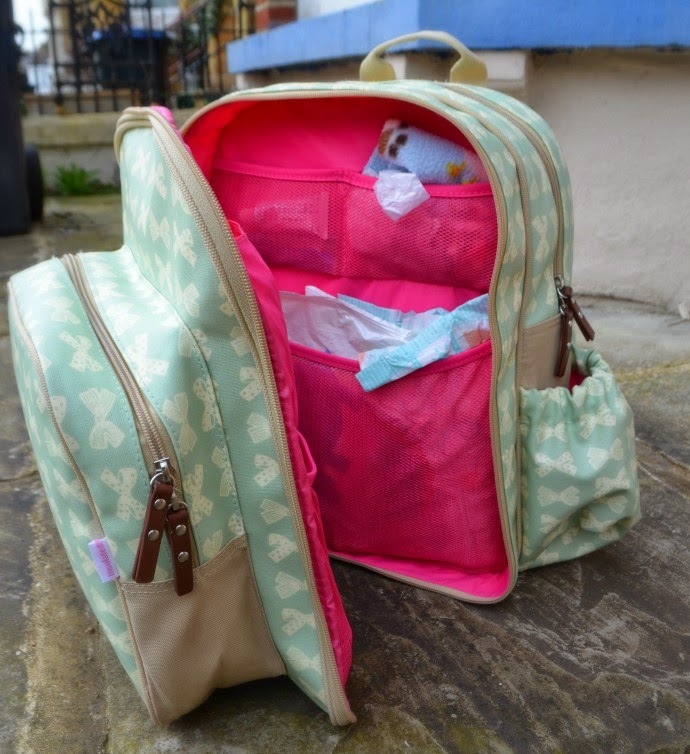 The Adventure of Parenthood: What's in my Changing Bag? 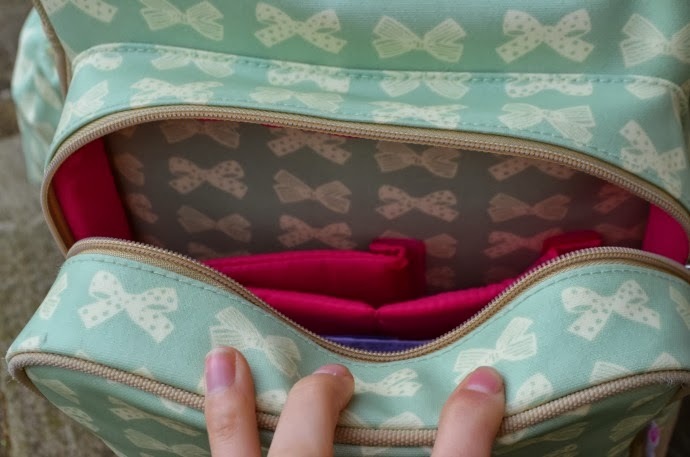 As a mother of two, my changing bag is never far from me. It carries everything and quite often doubles up as my handbag too. 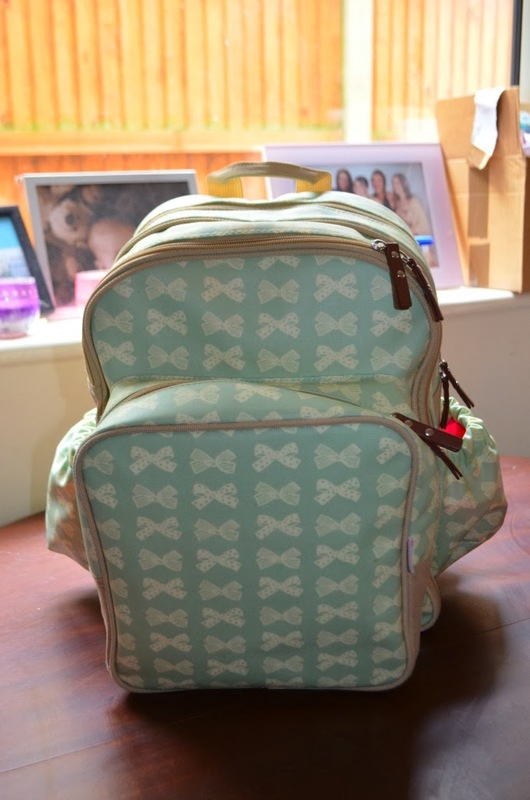 I have been through several bags over the two and a half years since Dylan was born, and I love the variety on offer, but at the moment, I am loving my new rucksack from Pink Lining. Cloth nappies - These are much bulkier to store than normal nappies but I love Archie's chunky fluffy bum. 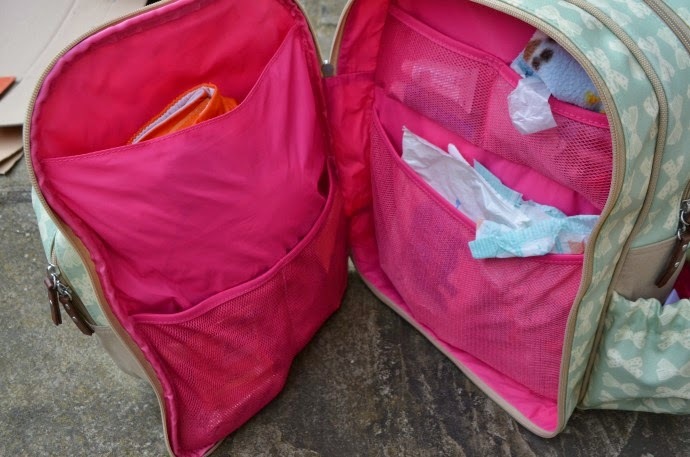 Now that I only have one in nappies it is much easier to fit everything in, as I need a wet bag for the dirty nappies too. Wipes - I cannot imagine a day when wipes are not a staple part of my bag. From changing nappies to snotty noses to realising you have yoghurt smeared on your jeans, these are an absolute essential! Snacks - My children would eat me out of house and home given half the chance, I have never once heard Dylan say he is full! I usually have raisins, organix toddler snack bars, a box of mini breadsticks and pouches of fruit as they all have long shelf lives and can withstand a bit of a battering if needed. Raisins are a lifesaver when I need the boys to sit still as they like to eat them one by one. Two spare changes of clothes for Dylan - we are on week three of potty training and Dylan is doing so well. He seemed to just get it from day one, but toddlers are unpredictable and we still have the odd accident. I don't want to be caught out, so I usually bring two changes of pants and trousers to cover all eventualities. Spare clothes for Archie - Sometimes just a vest, and sometimes a sleepsuit too, Archie can be a bit of a monkey and if he is let loose, he will find the muckiest thing he can and cover himself in it. Spare clothes are a must if I want him looking vaguely presentable for the day! Medicine - I carry a couple of sachets of calpol, a couple of sachets of teetha, some nappy cream and some paracetomol, as the last thing I want to be doing if one of us is ill is finding a shop to buy it in. Tantrum kit - If one of the boys has a meltdown at home, I can leave them to it, make a cup of tea and wait for them to calm down, but when I am out, I will do almost anything to ensure they don't show me up. Hidden in the back zipped pocket of my rucksack is some shiny new stickers, ready to be broken out when Dylan needs to calm down and have some quiet time. Stickers it seems can solve a multitude of problems! Toys - We often go on train journeys, and I find it helps having something little I can pop in the bag to keep them occupied. I have little rattles, books and cars at the ready and they live in the bag so are still a novelty. £5 - I am not too bad anymore, but the amount of times I locked myself out the house whilst I was pregnant became a bit of a running joke, and I soon learnt that it was best to keep some emergency money in my nappy bag for those long days when my keys are locked in the house! My keys (hopefully) and purse - As I usually take this bag and this bag only, I usually use the front pocket for my bits, notably my keys and purse. 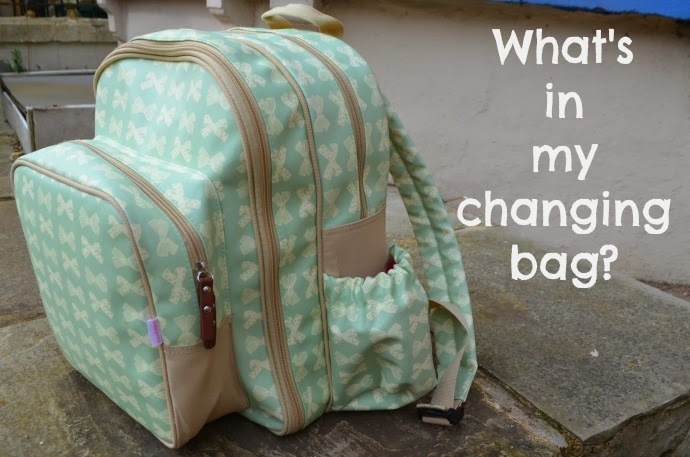 Do you have anything unusual in your changing bag? What is your tantrum survival kit like? The most truly bizarre thing in my nappy bag is Kitty's ballet shoes! I tried keeping them in a ballet shoe bag but we could never remember whether we had them or not so now they live in the bottom of the nappy bag and I know that on Saturdays I can just grab it and go! 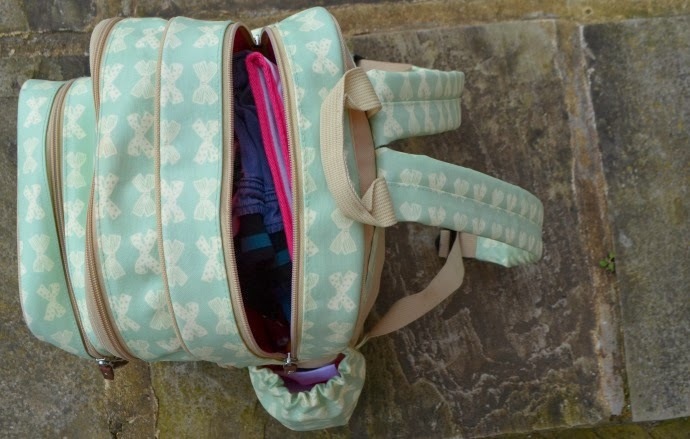 I like the idea of a tantrum kit too, and your bag is gorgeous - shoulder bags just fall off all the time with slings so a backpack is definitely the way to go! I read this paragraph fully concerning the comparison of newest and previous technologies, it's remarkable article. out from Austin Texas! Just wanted to mention keep up the fantastic work! else could anybody get that kind of info in such an ideal approach of writing? tribes that lived in the southern part of the continent learned basic farming techniques, for example. again, you will get a Death Lotfus scroll.